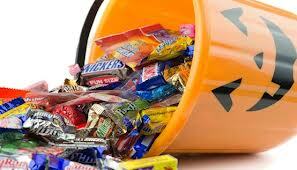 If you are anything like me, you have buckets full of candy in your house from Halloween. 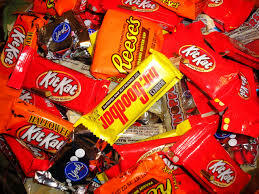 Whether it’s the candy that you purchased – stashed, let’s call it what it is, I stashed it! for a rainy day! wink-wink!!! – and subsequently did not give out, or one of the many buckets per child that came home and was tossed to the side, or the candy that you received from holiday spirit-filled co-workers and friends, whatever the case, you have lots of candy to manage. Well, today I have a few fun and practical ideas for tackling that mound of sugar that threatens your gums and your waistline before the holidays. Fun, because your children will see what you’re doing and want to “help” anyway that they can. 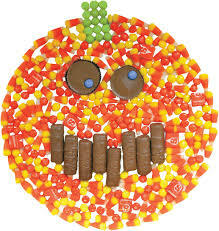 What child wouldn’t want their weekly chore to involve putting away the left-over candy? Check that right off your to-do list! So, what can we do with some of this candy? 2) Start your holiday gift giving early! Decorate old tins and jars in your home with glitter, glue, and other various knickknacks or Pick up a holiday-themed tin (with lid) from your local Dollar store, add the candy and tie a pretty bow around it. What a lovely gift and it cost you literally pennies to make. 4) Sticking with another food idea: mix those same chocolate-based products with vanilla ice cream for flavored ice cream. Now, that’s a treat every child loves! 5) And for those that have lots of those candy corns and mini pumpkins, what better way to preserve those stale treats and keep your child occupied for hours making candy art. Will they eat some of those treats? That is very possible, but the artwork will occupy them with something other than the television, and it may end up being decorations for next year’s festivities!! This is just some things that I do in my house. I’ve included links to other bloggers who have great ideas also! !